"Love this! I'll have to wait till my husband can cut/drill/nail it for me". This makes me so sad! I don't define myself as a feminist. I believe there are some characteristic special to each gender, but LADIES!!! You can use any tool your husband can! I promise! Men can be amazing hairstylists or interior decorators. So why can't women be amazing carpenters? Admittedly, most of us probably didn't grow up getting garage lessons from Dad or attending Shop Class in high school, but even without a Y-chromosome you can successfully wield power tools. That being said. Safety first! Fear is nature's way of keeping us safe. It makes perfect sense that when you see a sharp, metal, blade spinning extremely fast, your natural reaction is to stay away. That's probably how you've made it this far in life with all your fingers. By no means am I suggesting for your to grab the first power tool you see and flip it on without any knowledge or experience. Hopefully, that's where I come in. I decided to start this series of posts to help educated and explain before you take a chance on a new power tool. I also recommend finding someone who is familiar with a certain tool (friend, neighbor, guy at Home Depot), and have them show you in person how a tool works. I put a lot of thought into which tool I would review first. It didn't take me long before I came up with an electric air compressor. Why? Well, first of all, it isn't really a tool, but a power source for several tools. 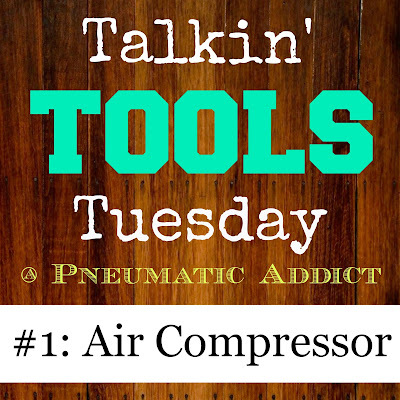 Becoming familiar with a compressor is the first step to using a number of other tools. 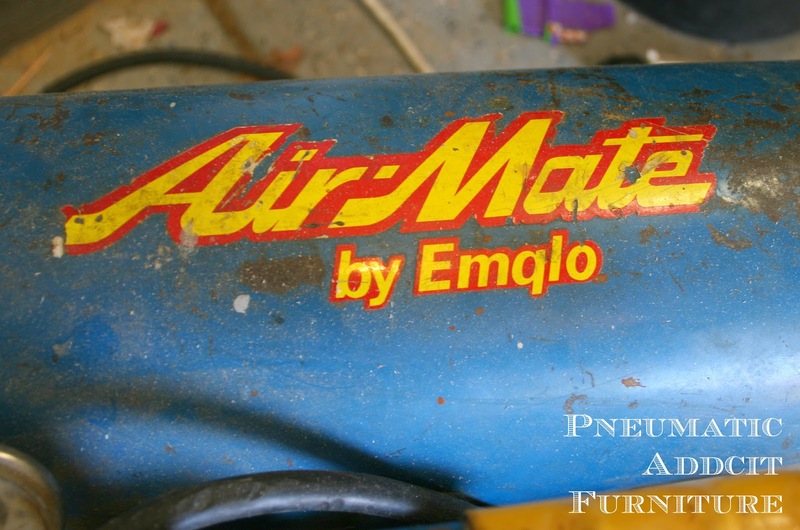 Secondly, its harder to hurt yourself with an air compressor than other power tools (but not impossible), so I thought it may be a safe place to start for some ladies who have never so much as stepped foot in a garage. And lastly, c'mon... My name is the Pneumatic Addict. What else would you expect? 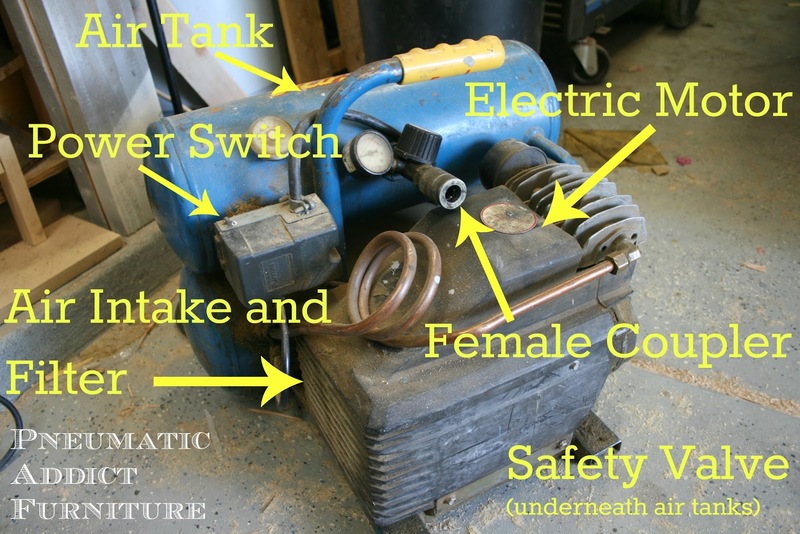 Here is my electric air compressor. It's old, ugly, and give me fits from time to time, but I sure do love her. My husband and I "borrowed" it from my father-in-law so often that finally he just told us to keep it. It has a 4-gallon tank and a 1/5 horse power motor. How big of a compressor do you need? In my opinion, its hard to find one too big or too powerful (I'll explain why in a minute). The two downsides of a larger compressor are lack of portability, and cost. Mine keeps up with me for the most part, but when I'm painting I REALLY wish I had a larger tank. Shall we have an anatomy lesson? 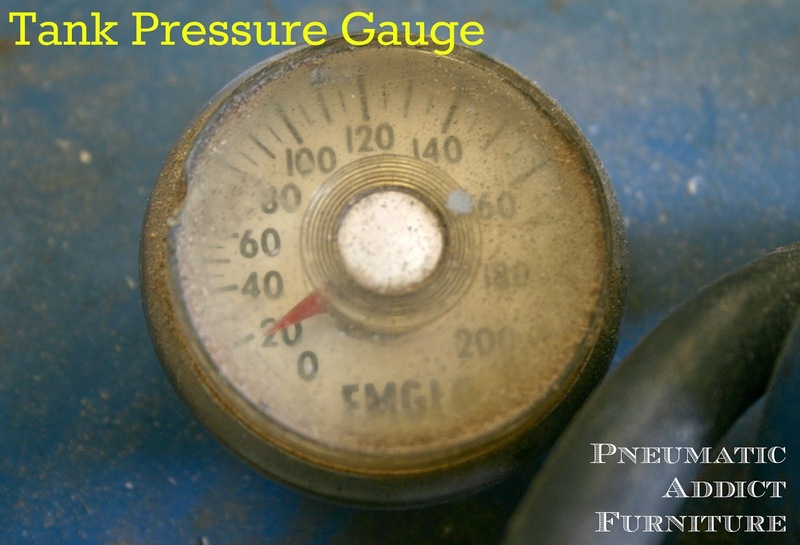 Next, is the tank pressure gauge. It does exactly what you think it would; it tells you the pressure inside the tank. The next piece is SUPER critical. Its the regulator and PSI (pounds per square inch) gauge. 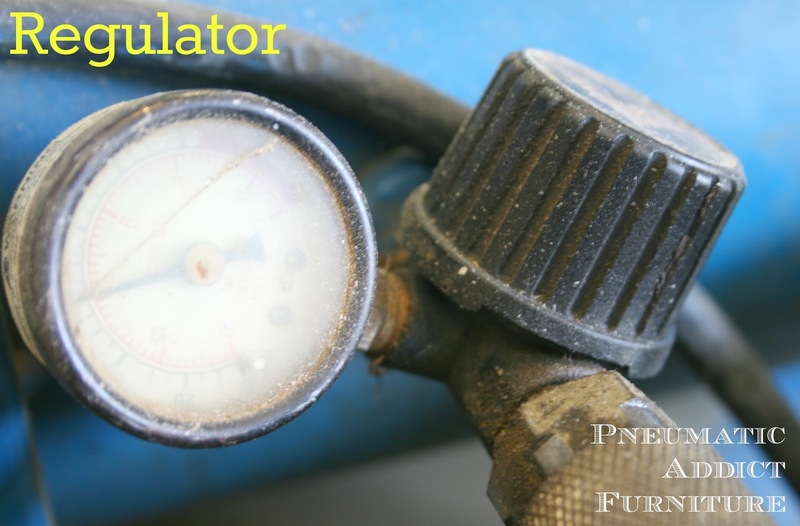 The regulator controls the amount of air that comes out of the tank. This is why, to me, you can't have too large of a compressor. You adjust the air pressure, through the regulator according to the tool you are using. Most pneumatic tools have a MAX PSI printed on them. *This is one of those times you really need to "follow the rules"! Remember how I said it isn't impossible to get hurt with a compressor? Tools have PSI limits for a reason. Plus, they typically function much better in that range. Including the electrical components, that pretty much sums up the compressor itself. Next, it the essential accessory you must have to utilize all that compressed air. An air hose. 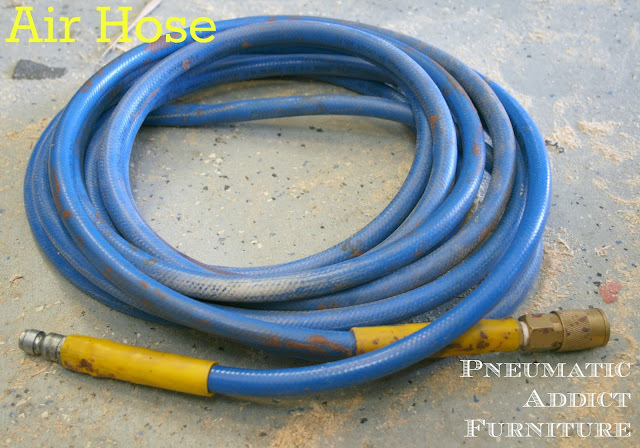 Air hoses come in a mutitude of lengths, diameters, and materials. 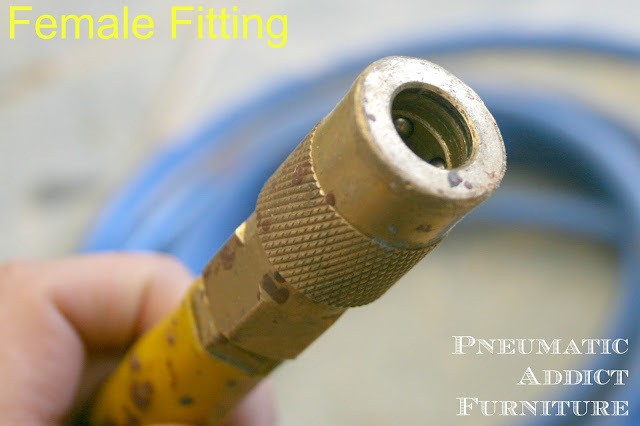 Some hoses come with fittings already attached, some don't. For the most part, you are going to want to use the basic set-up of one female coupler on one end, and one male fitting on the other. Fittings aren't all the same size either. They come is 1/4, 3/8, and 1/2 inch diameters. Make sure your male fitting fits into the female coupler on your air compressor, and that the female end of the hose fits the male end of the majority of your tools. If they don't fit, no worries. They make adapters. To join the two fittings, push back the sleeve by pulling on the textured area, and while its pulled back, insert the male end. Let go of the sleeve and it will spring back into place. (p.s. I just blushed typing those sentences). 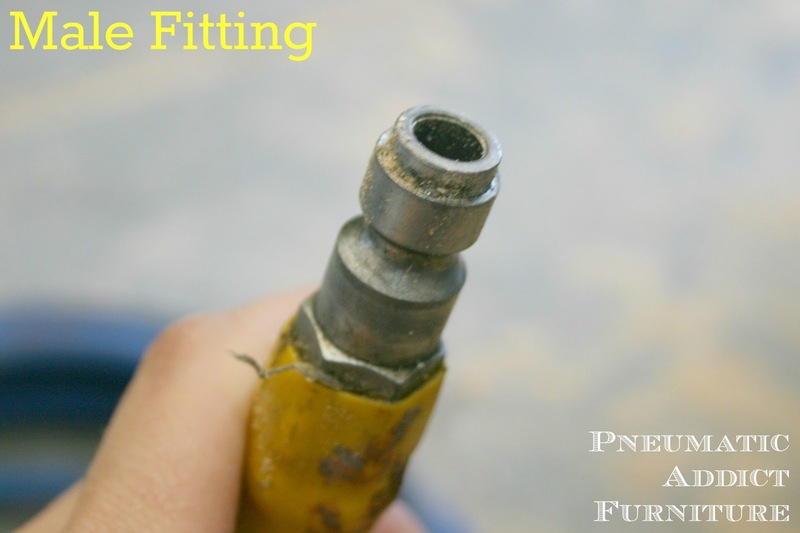 Once you have your hose and fittings set up, you're ready to plug in a tool and get started. These are the 3 tools I am constantly using. 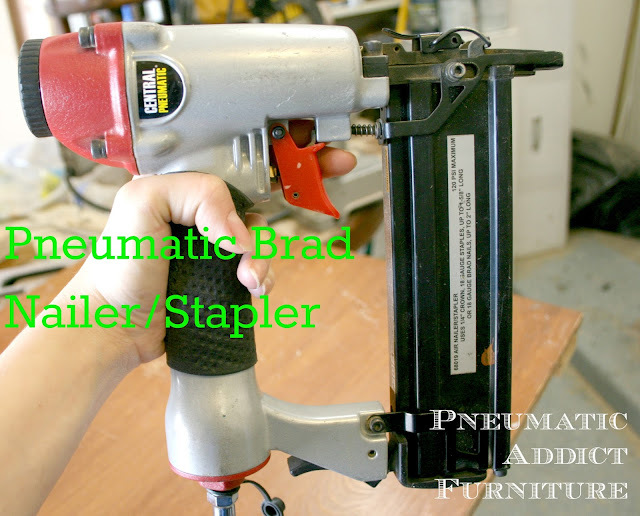 I could not live without my brad nailer/stapler combo. It changed my life. 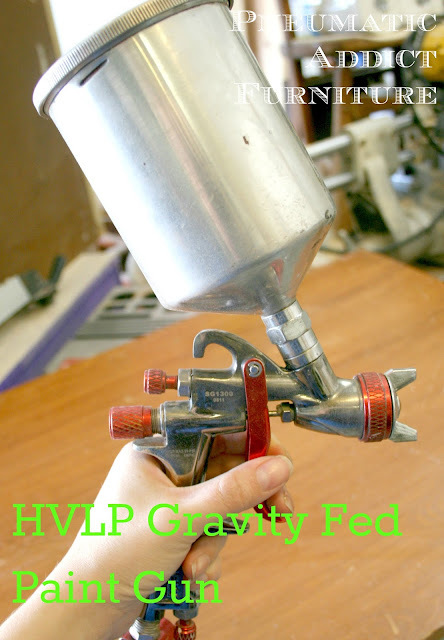 I have only been using my HVLP (high volume, low pressure), gravity fed paint gun for about a year, but I LOVE it. I will never brush chair legs again! Every garage could use an air nozzle! Very handy for blowing dust off of a piece of furniture, or even cleaning the cracks in the concrete floor. If I have convinced you to buy an air compressor, I would recommend starting either on Craigslist or Harbor Freight.Compressors can be pricey, so you may want to start with something used or just a generic brand until you can invest in a little more expensive one. I know, I know. "Harbor Freight tools are junk, yadda yadda." I own several tools from harbor Freight and rarely have issues with them. In fact, all my pneumatic and electric tools from there work like champs! They have a little 3 gallon on sale right now for $59.99. If you plan on airing up tires or shooting finish nails through it, it should keep up fine. I know this post was ridiculously long, but I feel like I barely scratched the surface. If you have any more questions, please feel free to ask. Keep posted for tips on a new tool next Tuesday! Okay. You have convinced me. Next time I have money (So like in 2 years) I am getting a compressor! I actually have borrowed my FIL's a couple of times but the last time, we kept it so long, I think he's never going to lend one to us again. :( Seriously great info here though- and I am REALLY excited to get an HVLP now. No brushing?! SOLD!!! I hope--one by one--between us, we can win more women over on BEING FEARLESS! My husband taught me to use a couple of air tools and now there's no stopping me, lol! I have had very good luck with Harbor Freight, I'm not sure why people are so biased against them. I have graduated to better quality on a few things (paint sprayer, for example) but overall I'm very pleased. The reciprocating saw is my next favorite tool - flippin' awesome how it cuts through stuff ... and then there's my flux welder ... and the drill press and ... Geez, power tools are all just so much fun! We have a giant tank that is way hard to move. buying a small portable one has made so much difference. And I agree with ya on Harbor Freight and Tools. Would that Harbor Freight air compressor also work with a paint sprayer? How much power would that need? Thanks! Would that Harbor Freight air compressor be big enough for a paint sprayer? Great post. I love power tools. The garage of an estate sale is paradise to me. Yes, I'm the fearless sort. This is a great tutorial. Thank you for helping to empower women to tackle building projects. I started a couple of years ago, and haven't looked back since. I just want to learn more and more. Thank you for sharing at What We Accomplished Wednesdays! I really want to get over my fear of the circular saw. I'm so glad you shared this! Please, if there is a particular tool you would like to have more knowledge of, let me know! Circular saw is on the list to write about! Stay tuned. I wish my wife would read this. Every time I pull out the air compressor, my wife freaks out because of the noise. She's also worried that it will blow up or something. I keep trying to show her how to use it, but she's not real interested. An air Compressor is one of the major energy consuming utilities in any industrial operation and are mainly classified in two types. Thanks for sharing this wonderful blog Elisha. This air tool is very useful! I think I need this for painting my old bike. Nice to see a blog post especially for women. Infect women need to know about the use of tool i.e. air compressor as discussed here. Checkout more here. It will inform you more about the air compressor and its related issues as well. Great number of informative photos! Thanks. This is fantastic post, Elisha! I enjoy a lot reading you blog! Power to the ladies! I totally agree with this post. I was initially insecure using power tools but now I can say that the framing nailer is one of my favorite tools around the house and can use it without my husband around. Good post thanks. You nailed it when you said that the trick is to find the ballance between size and portability. 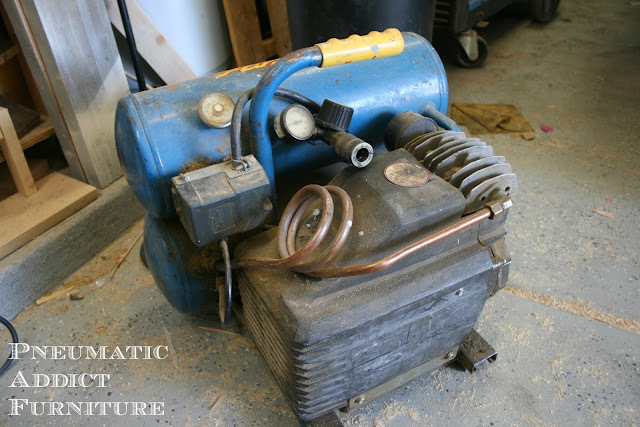 Most DIYers prefer a portable air compressor, but the trick is to find one big enough to run all the air tools - you don't want to spend most of your time waiting for the tank to fill. the best way to go is to visit a review site like The DIY Hubby to compare air compressors and find the best model for your needs. This air tool will help so much. Thank for share the post. It's a nice product. Thanks for sharing! Well, I think I'll go and buy a air compressor like your. It's so cool. Thanks so much for sharing! Great tips especially for newbies who have no idea about the basics of these tools! It seems you use spray gun with the compressor. 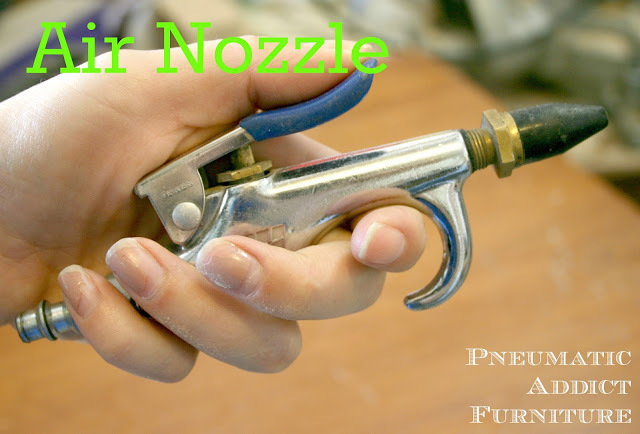 When it comes to spray gun, one should have a compressor with big tank, otherwise you will run out of air very frequently. Spray gun requires high SCFM rating to operate.